Domestic violence, or intimate partner violence, can happen to anyone of any race, age, sexual orientation, religion, or gender. It can happen to couples who are married, living together or who are dating. Domestic violence affects people of all socioeconomic backgrounds and education levels. (thehotline.org) Abuse is a pattern of behavior used by one partner to gain or maintain power and control over another person in an intimate relationship. Legal definitions of domestic violence vary from state to state. Click to learn more about Indiana and Kentucky state laws. Although every relationship is different, power and control tactics are the most common element of a relationship where abuse occurs. 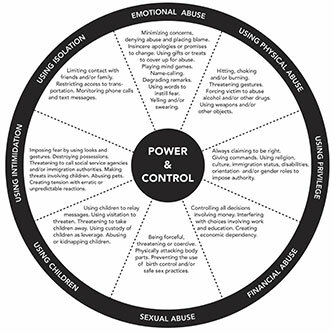 The Power and Control Wheel is a helpful tool for illustrating the various ways an abuser can trap the victim in a violent relationship. These tactics may include physical violence, sexual assault, isolating a person from support systems, and a variety of other behaviors. Power and control tactics threaten a person’s physical and emotional safety, making it challenging to leave the relationship. Those experiencing domestic violence can work in partnership with The Center’s advocates to establish safety and begin to heal from the trauma of abuse. Unfortunately, domestic violence occurs at alarming rates. According to the National Intimate Partner and Sexual Violence Survey, in Kentucky, more than 1 in 3 women (37.5%) and nearly 1 in 3 men (31%) have been victims of intimate partner violence. In Indiana, approximately 2 in 5 women (40.4%) and more than 1 in 4 men (26.8%) have been victims of intimate partner violence. Domestic violence is a public health issue affecting our entire Kentuckiana community. Whether a victim of domestic violence is currently with an abusive partner or has left the relationship, risk of injury and death are very real concerns. It is important to recognize that a victim is most at-risk for violence from an abuser immediately after ending an abusive relationship. A survivor of intimate partner violence may experience anxiety, hypervigilance, PTSD symptoms, alcohol or drug abuse, suicidal thoughts, and other trauma responses regardless of whether a person has ended an abusive relationship. After ending an abusive relationship, a survivor may continue to feel unsafe and struggle with trust and intimacy. If you have a friend, family member, or coworker who may be experiencing domestic violence, it’s important to support them regardless of their decision to remain in or leave the abusive relationship. It’s important to express your concern for their safety and well-being without showing judgment for their choices. By connecting a survivor with The Center and supporting their healing process free of judgment, you are recognizing them as experts in their own safety and healing. Supporting someone in surviving and healing from trauma can be difficult; please remember that The Center is here to support you, too.